Mooventures | Moo ventures across the big wide world! I am excited to share that on Sunday, August 13, 2017, I will be running in a 50-mile relay to empower women and raise funds for Planned Parenthood League. Run 4 All Women was born in the early weeks of 2017, right before the inauguration, as many were worried about what the future would hold. Founder Alison Desir, was searching for a way to reconcile the frustration and fear she felt; was there a way to affect real change? The story of how this movement has grown is a fascinating one – I urge you to read more about it here. In short, Run 4 All Women uses running as a vehicle for social change, and to organize/conduct running events that empower women to be the change they seek. I am especially excited about this opportunity because it brings together many things I care deeply about, including running, grassroots activism, and social change. RUN WITH US! Runners (women AND men!!) are invited to join the run at changeover locations, and walkers will be invited to join at the last 2 and 3 mile locations. To sign up for a leg, please fill out this Google doc. Volunteers are also welcome to provide support along the course. MEET US AT THE FINISH! Friends, family and allies are encouraged to gather at the end of the route to greet runners as they finish the journey, at Thomas Park in South Boston. If you’ll be out of town the weekend of the event but still want to catch up on how it went, you can join us at OTTO for a pizza and community building fundraiser. Thank you for taking the time to read this and for your continued support as I pursue new and exciting adventures!! It’s now been a month since my Breaking2 experience and I can honestly say not a day has gone by that I haven’t thought about or referenced it. Whether it’s keeping up with the friends I made there via WhatsApp or social media, looking through photos on my phone, or simply needing to channel the energy from those 4 days during the tough parts of recent runs, I think it’s safe to say that the experience has definitely changed me. In the spirit of wrapping up describing my experience, I thought I’d share one last reflection about what has stuck with me the most. These are in no particular order. One of the things I’ve shared over and over again is how little ego there was with the people I met. I was running with blazing-fast runners from all over the world, but these same speedsters were running with me during the 5K, Breaking2Together and the long runs. It was the first time I was around that many runners and not ONE person asked me what I was training for. The question instead was “How did you get into running?” No one asked me for my times so they could secretly judge me on how fast a runner I was. No one blew by me on a run without taking the time to run with me and get to know me. I can honestly say it was the most free I felt around running, and I actually felt like others saw me as a true runner – not just someone who is trying to fit into the running world. It’s hard to describe, but it’s a very real feeling I have and one I’m holding onto. This photo illustrates for me the community we built. All of these guys BLAZED through the 5K, but stayed and cheered everyone on until every single person had crossed the finish line. I love this image and I can remember being there like it was yesterday. I love so much about this photo and what it represents: that he stuck it out and finished even though he got lapped and was clearly in some pain. He defied those tho questioned whether he would make it or whether he’d give up. He may even have been forgotten by those who shifted all of their focus onto Eliud. I think I feel like I can relate to Lelisa in this moment – especially when I’m at practice. I know I’m one of the slowest that shows up every week, I know there are others who look at me and wonder why I’m there, or question if I’m fast enough to be on the team. And if I’m being completely honest, I ask myself the same questions some days. The redemption in this photo is the moped support who never left him even when the pacers couldn’t run with him because they were pacing Zersenay and Eliud. As I watched him pass us every lap I kept thinking “At least he’s not alone.” There are moments in practice or on a long run when I feel very alone and therefore self-conscious about how slow I am. But if I’m lucky, I get a word of encouragement from Kyle at practice, a high five from Coach Dan, or I’m able to muster up the mental fortitude to push myself through. Watching Lelisa at Breaking2 reminded me that there’s always going to be someone who’s last, and if it ends up being me at practice, I have to do with Lelisa did: keep pushing and moving forward. I have been lucky that throughout my athletic endeavors, I’ve had some phenomenal coaches. Through my current job I have seen it all – from subpar to outstanding coaches and it’s clear the difference they make. At Breaking2 I met coaches from run crews around the world and it was clear they took the time to build relationships with the runners in their community. They had a vision for their crew and it was exciting to hear where they wanted to go next. One of the highlights of the trip was getting to meet and spend time with Coach Bennett, the NRC Global Run Coach. His entire coaching philosophy is his belief in better and the potential he sees in every runner. I’ve been following him on social media for a while, but at Breaking2 I not only got to meet him but also spend a lot of time learning from him. His hunger for improvement – for himself but mainly for others – is contagious. One of the highlights of the whole trip for me was during the last quarter mile of the 5K on the Monza track, he ran me in. He literally ran alongside me and encouraged me to dig deep to push farther. “Think about what Eliud did on this track a few hours ago! This is YOUR Breaking2, Rachel!” I visualized so much during that talk and for the first time I could see myself as a real runner. He ran me to the finish and it was the strongest I felt at the end of a 5K! The following day, Coach Bennett asked me some questions for an interview for Nike and one of his questions was “What is your Breaking2?” The question caught me off guard – I had never even considered that idea. Coach Bennett was able to break down what the deeper meaning of the question was and after the interview we talked about what it means for me. I told him some of my big goals – goals that I literally haven’t told anyone because I’m usually so self-conscious around other people. I feel like if I tell others my running goals, they’ll immediately judge me for being so slow. But Coach Bennett’s reaction? He smiled, said, “Great! Now that you said them out loud, you’ll reach them.” Just that simple statement made me feel empowered (and motivated) to chase those goals. Thanks Coach Bennett! Belgrade Urban Running Team (BURT) is a group of runners, as well as those who have to become. We don’t care whether you live for sports, or sport is only one chapter in your everyday life. We invite all friends who want to #bridgethegap and enjoy socializing after each urban run. Zagreb Runners:no plans, no boundaries, no limits, no reasons, no rules, no destinations… Just run, party and repeat! We don’t run to earn, we don’t run to compete, we don’t run to win! We run to understand, to have fun, to get lost, to help, to smile, we run to live… Join us! You don’t need anything, just RUN WITH YOUR ♥! 442 Crew – We had troubled past, but we’re focusing on future full of miles and smiles. Belgrade Urban Running Team and Zagreb Runners realised that they share same passion, lifestyle, same ideas for brighter future, mutual love and vision that running crews can and will overcome politics! We are two cities, two nations, two running crews, but we are one family and one love. We Run Clan – We are the first Polish running crew of it’s kind; uniting a group of people from all walks of life who share the love for running. We are serious about running, but more serious about being part of something more important than the time above the finish line; meeting like-minded people in places all over the world. The common themes that stood out to me as I learned about everyone’s run crew were: community, uniting others, bridging gaps, and wanting to be part of something bigger than racing. It was so cool to not only hear about them talk about these things, but to see it in action. There was also no rivalry between crews – I saw a high level of mutual respect. Maybe it was because they are all running for a greater purpose than just getting fast, but I feel like my whole perspective on running has shifted since meeting them. To say being part of this entire Breaking2 experience was a “once in a lifetime” opportunity is a huge understatement. Life-changing? Absolutely. I would say that the shifts in my thinking about running, the new energy I bring to workouts, the relationships I am building within my running community, and the connections I have around the globe have all contributed to making me not only a better runner, but a better person. So to EVERYONE who was part of this journey with me, THANK YOU, and I can’t wait to do it all over again soon!! So just to recap what happened in the first 48 hours of Breaking2, we ran a 300-person relay in Piazza Duomo, got inspired by Coach Bennett every time he had the mic, watched the Breaking2 attempt trackside, and ran a 5K on the exact same course – all while getting to mingle with some of the greatest runners across the globe. Pretty epic. Well, Sunday morning comes around and we were all grateful for a morning when we didn’t have anything scheduled until 10:00am. Kate and I are still trying to stay warm in our sleeping bags when all of a sudden this beautiful violin music starts to play. Talk about the best alarm clock ever – and even though it was earlier than I think anyone was planning on waking up, the sheer beauty of the music made up for it. Then Kate said, “I think that music is live!” Admittedly, I doubted her in the beginning, but then the more we listened, the more feasible it seemed. We finally looked out the tent door, and sure enough, there was a LIVE violinist playing or the whole camp. Long Run with Shalane Flanagan – A few hours after the Pacer Party, we went on a long run with Shalane Flanagan! We had a choice of a 30, 60 or 90-minute run. It was the run with the best weather and some sweet views en route to Milan. And thanks to Allyson Felix for her time – it is a day I will never forget! Campfire with SHEroes! As if the day hadn’t been EPIC enough, we had dinner and a Campfire talk with Joan Benoit Samuelson, Shalane Flanagan, and Allyson Felix. So much power, speed and awesomeness all on one stage, hosted by Coach Becs. The stories and advice they shared inspired everyone at camp. And that wraps up the “epic events” recap of the trip. Still so many thoughts running through my head that I want to share – but that’s for the next post. Thanks for reading! We then proceeded the biggest plane I’d ever flown on. When I traveled to Ghana we were on a big plane, but this one was two floors and even the coach seats were quite spacious. I’d like to say the flight went without any incident, but unfortunately I got violently ill a few hours in. After puking my guts out, I returned to my seat where I suffered through an hour of a raging headache, before falling asleep for a few hours and woke up feeling much better. We landed in Milan, and after breezing through customs, met our driver as well as two other contest winners – one from Korea and one from Taiwan. We then started the drive out to Monza and for parts of the drive the Alps provided an an incredible backdrop. We finally arrived at Parco di Monza where Nike and Airbnb had literally built Breaking2 Camp. I stayed in yurt 25 with my awesome tentmate Kate, from the UK. Runners were put on teams and each member of every team ran the track 3 times, for a total mileage of a marathon with the ultimate goal seeing if together we could break 2 hours for a marathon. There was also DOPE live band during the whole relay. We got to back to camp quite late – ate dinner around 11:15pm – and that was when we were told that our wake up call would be at 3:30am. A majority of us were already running on fumes and adrenaline but the buzz and excitement of Breaking2 was on the forefront of our minds and Coach Bennett reminded us that it was our responsibility to go out and support these runners and pacers. It was the only evening of the trip in which everyone went to bed without much fanfare. A little background on me: If you had asked me just 5 years ago that I would become a runner, I would have probably laughed in your face! I would have said, “I’m a swimmer, not a runner…I don’t do well on land.” And yet, here I am, someone who over a few short years has run 4 marathons, countless other races, and can finally call herself a runner. It’s been quite a journey, and to say that running has changed me would be a huge understatement. Now that I’ve been in it for a few years, I can’t imagine my life without running. Nike teamed up with Airbnb and held a contest in April for a chance to win a trip to go and witness the Breaking2 attempt in person. Along with the usual info needed to enter a contest, entrants had to answer the question, “Why do you run?” This is a question I get asked often, especially since I am still relatively new to running. Most people who know me already know the answer, but for those of you who may not know, I started running to fulfill a promise I made to one of my former students – that when he turned 18, we would run our first marathon. My student was Martin Richard, the youngest victim of the Boston Marathon bombings, and I knew I had to complete the pact we made. I shared a bit of my story for this contest, knowing that everyone who entered had a story to tell. I’M GOING TO BREAKING2 IN ITALY! When I enter contests, I never go into them thinking I’m going to win, or that I even deserve to win. So you can imagine the shock I felt when I received an email saying I had won this contest! I had to re-read the email a few times because I couldn’t quite believe that it was real. When it finally settled in that this was really happening, I was blown away. I just kept thinking to myself, “Me? Really?” And then I got the confirmation email, and flight/lodging info and then it hit me that I am going to Milan, Italy. I am thrilled and beyond excited for this incredible opportunity! I hope to post updates here while I’m gone, but if for some reason I have trouble connecting to the internet while I’m gone, I will definitely be sharing my experience when I return. Here’s hoping I get to witness history in a few days! I always hear two big themes around this time of year – reflections on the past year, and/or resolutions people are going to make. As a general practice, I think reflecting is a good exercise. It’s good to go back and remember both the great things and challenges that I have been through. Resolutions are a bit different for me. I always hear people “swear” they will stick to them this year and often this is followed by a litany of reasons (ahem, excuses) as to why things didn’t work out the previous year. Making new year’s resolutions has not been something I have ever been in the habit of doing. Occasionally I might, in my mind, think about what I would make as my resolutions, but I don’t actually declare it. Maybe because I’m afraid I won’t be able to hold to it. It feels a bit like setting yourself up for failure, I suppose. “Patience and perseverance, if we have them, overcome mountains of difficulties.” – Gandhi. I confess that I lose my patience more than I care to admit. Over the past year I have been realizing that being impatient doesn’t ever fix anything – it really just makes me more aggravated. Transitioning from teaching to traveling to returning to grad school has taught me some valuable lessons about patience. Stepping back and remembering that I don’t know what’s going on in a situation or with a person I come in contact with reminds me that I need to exercise patience the same way I hope people will with me. 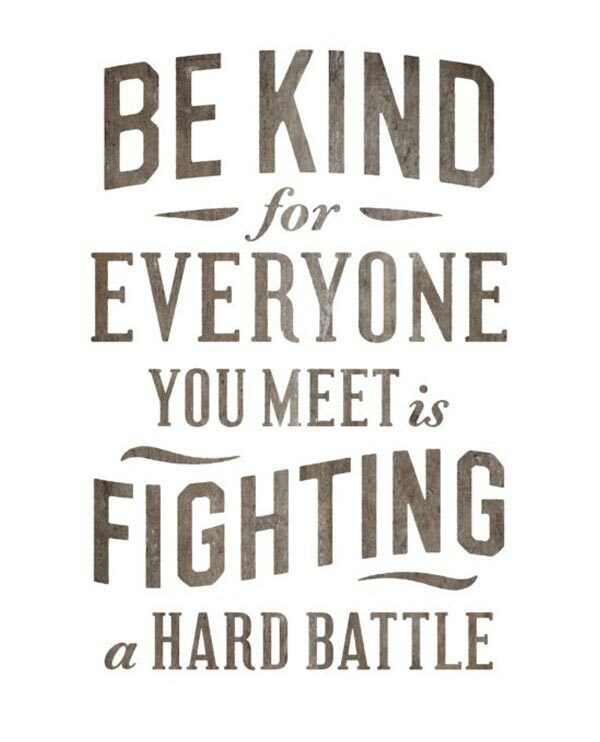 For me, this means being less judgmental and more compassionate. 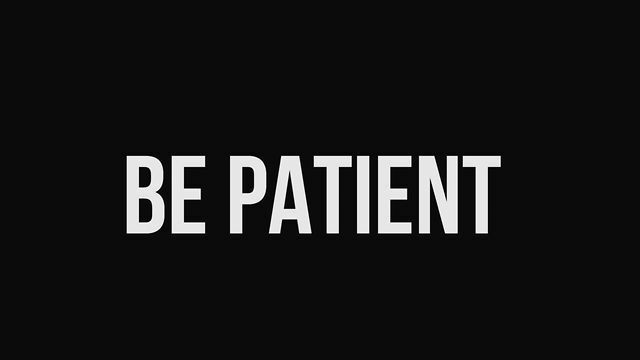 This one is closely connected to being more patient. I am trying to train myself to respond to situations with compassion first – because I would hope that others would respond to me the same way. I love the Plato quote above because it’s so true. I don’t know the trials others are facing when I meet them, but if I err on the side of compassion I will hopefully not add to that person’s challenges. This is something I definitely am guilty of not doing enough. 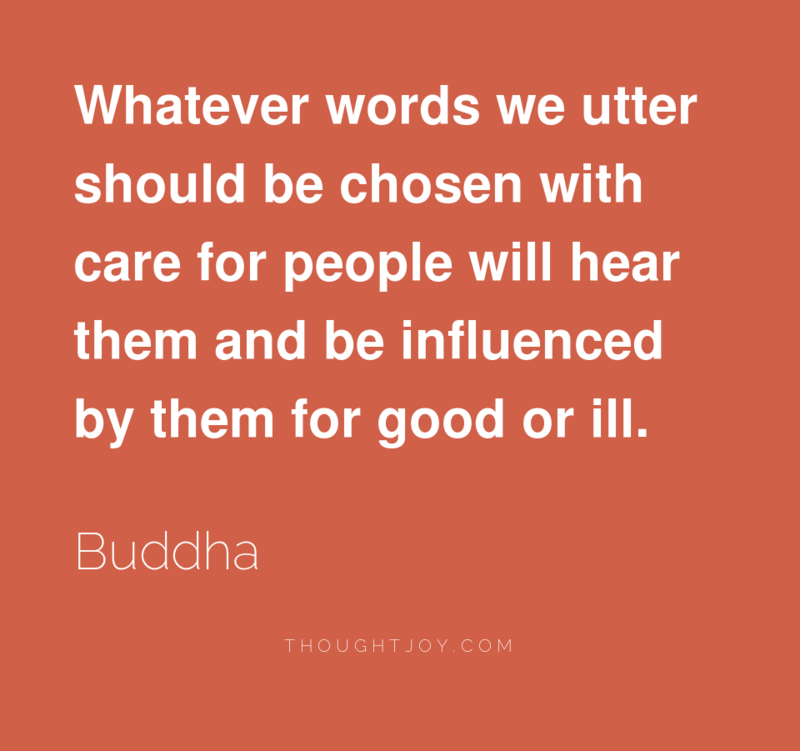 When I am impatient, lack compassion, or don’t watch my words, I lose my ability to love others the way I should. Love always wins in the end, and that’s the way it should be. I want to be a person who loves others first – before making assumptions or judgments. I am grateful for the friends in my life who consistently model this and they serve as reminders that I need to do it more. I am hopeful that like other things in my life, the more I do it, the better I’ll get at it. This is a really hard one for me and I’m still trying to figure out how to make this happen. 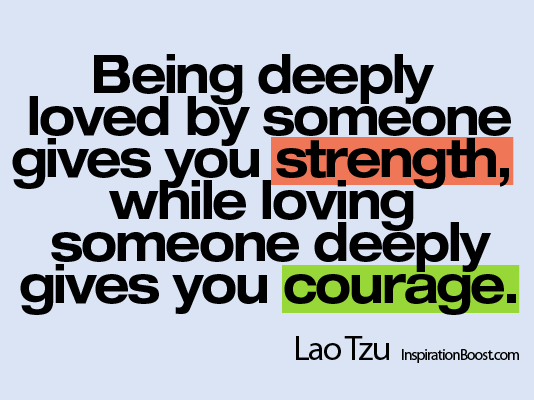 I find it infinitely easier to love others as opposed to allowing others to love me. However, the events from this past April left me in a space where I had to allow others to love me in order to get through it all. When I reflect back on the first few weeks of the aftermath, I am still struck by the way others loved me. I remember the texts, emails and phone calls, I remember people opening their homes to me so I wouldn’t have to be alone, I remember the meals I shared with friends because they knew I was too distracted to think about eating, and I remember the visits from friends months later who came to check-in on me. But most of all, I remember the immense amount of love I felt. Friends from the other side of the world and the other side of the country were constantly reminding me that I am loved and it was powerful thing when I felt like my back was up against a wall. While the circumstances that led to this outpouring of love are not ideal, I will forever be thankful for the reminder. It allowed me to see know that it’s okay to let others love me. 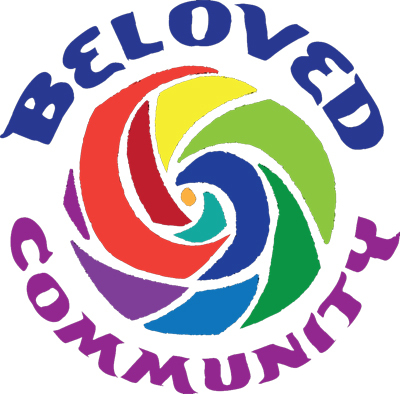 I am striving to build this Beloved community and I hope you will join me. 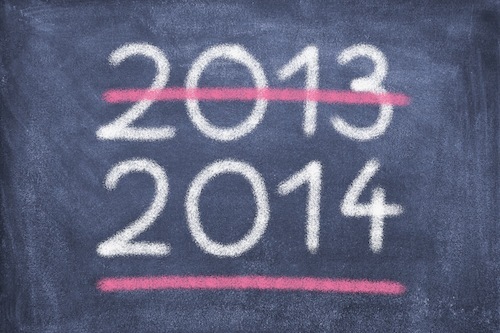 So there you have it – my reso-flections at the dusk of 2013 and the dawn of 2014. I am grateful for all that the past year has taught me and looking forward to the adventures that lie ahead. Thanks for joining me on the journey – it’s been a much richer experience being able to share it with you. 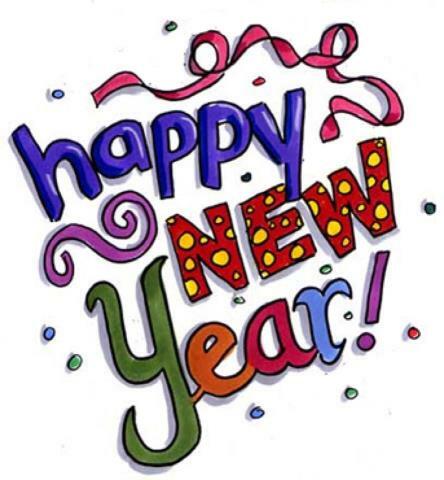 I’m wishing all of you health, happiness, love, and peace in the New Year! I was wondering if you are going to make any more posts. I really enjoy reading them because they are very informing and comforting. 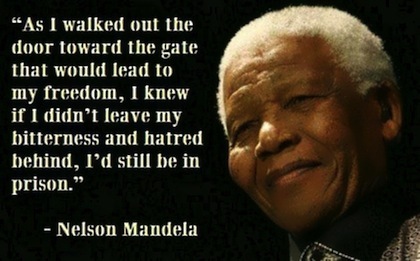 I think Nelson Mandela would be a good topic because I know that he wanted peace but I don’t know much else. I hope to hear from you soon! One of the reasons why I didn’t write about Nelson Mandela closer to when he died, was because the impact it had on me was profound. I have been a longtime admirer of his, and for me he was one of the last living ahimsakas in our world. But I am glad to hear you’re interested in learning more. There is so much to tell about Nelson Mandela and his life, I’m not entirely sure where to start. If you’re a regular reader of my blog, you know I always enjoy talking about Gandhi and his life. I thought I would share about Gandhi’s time in South Africa and how his commitment to nonviolence was established while there, as well as how part of Mandela’s legacy was rooted in work Gandhi had accomplished while he was in South Africa. 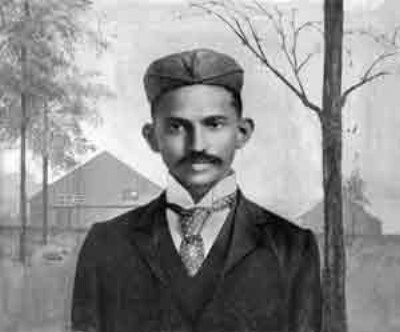 At age 23, Gandhi left India and traveled to South Africa, hoping to earn a little bit of money and to learn more about being a lawyer. Only one week after he arrived, he was asked to go on a long journey that included transportation by train and stagecoach. When Gandhi boarded the first train of this journey, railroad officials told him that he needed to transfer to the third-class passenger car. When Gandhi, who was holding first-class passenger tickets, refused to move, a policeman came and threw him off the train. That was not the last of the injustices Gandhi suffered on this trip. As Gandhi talked to other Indians in South Africa (derogatorily called “coolies”), he found that his experiences were not isolated incidents but rather, these types of situations were common. During that first night of his trip, sitting in the cold of the railroad station after being thrown off the train, Gandhi contemplated whether he should go back home to India or to fight the discrimination. After much though, Gandhi decided that he could not let these injustices continue and that he was going to fight against the discrimination. Gandhi spent the next 20 years working to better Indians’ rights in South Africa. 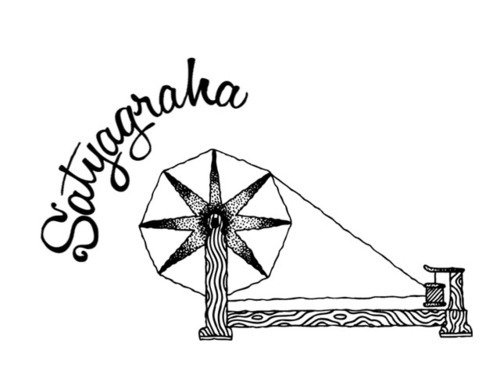 In practice, satyagraha was a focused and forceful nonviolent resistance to a particular injustice. A satyagrahi (a person using satyagraha) would resist the injustice by refusing to follow an unjust law. In doing so, he would not be angry, would put up freely with physical assaults to his person and the confiscation of his property, and would not use foul language to smear his opponent. A practitioner of satyagraha also would never take advantage of an opponent’s problems. The goal was not for there to be a winner and loser of the battle, but rather, that all would eventually see and understand the “truth” and agree to rescind the unjust law. Gandhi’s 20 years in South Africa helping fight discrimination was foundational in his development of satyagraha, which would later help lead India to its independence. 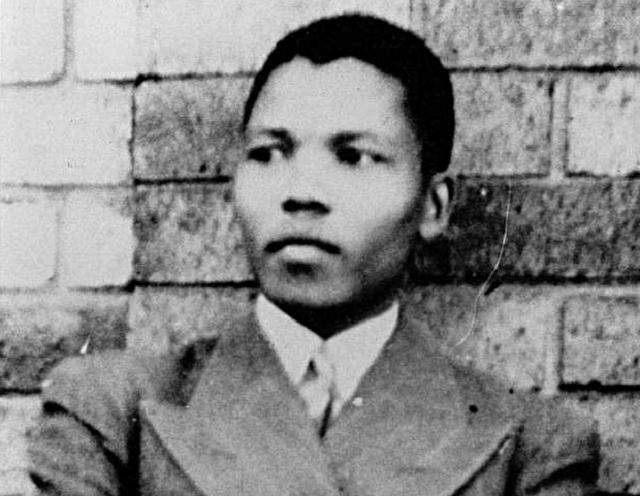 Mandela grew up in South Africa during apartheid (in the language Afrikaans, the word apartheid means ‘the state of being apart’), which was a social system in South Africa that forced white and non-white people to live in separate areas. Non-white people meant black people, people from Asia and people of mixed race. A white and a black person could not marry. Black and white people could not share a table in a restaurant or sit together on a bus. Black children and white children went to different schools, and sports teams were all-white or all-black, never mixed. When Mandela was growing up, black people had little say in how South Africa was run. The government was whites-only. Most black people were poor and worked as servants – they worked on farms and in factories and gold mines. In 1944, Nelson Mandela joined the African National Congress, or ANC. The ANC wanted black South Africans to have the same human rights as whites. Mandela led young people in the ANC. Many white people, as well as black people, spoke out against apartheid. 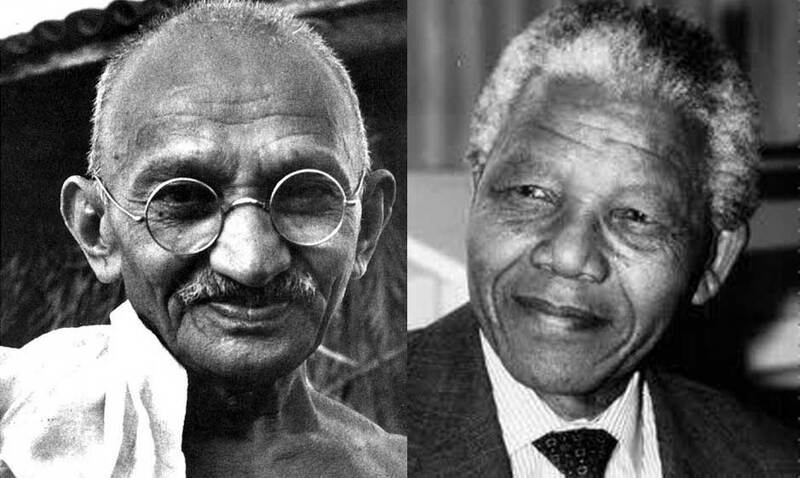 Mandela admired Gandhi, who had used peaceful protest in India. 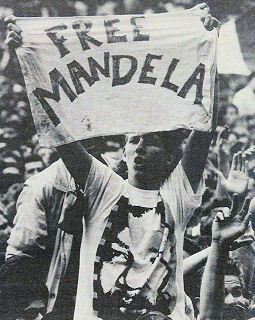 Mandela thought that perhaps peaceful protest could get rid of apartheid, without fighting. 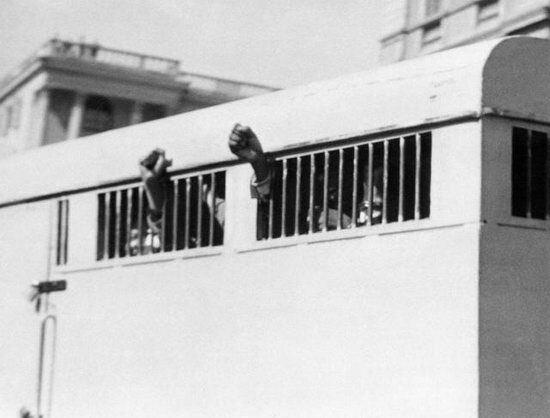 Speaking out was dangerous though – in 1956, Mandela and 155 other people were arrested for treason. (Treason means attempting to overthrow the government of one’s country.) After a trial lasting five years, he was set free in 1961. 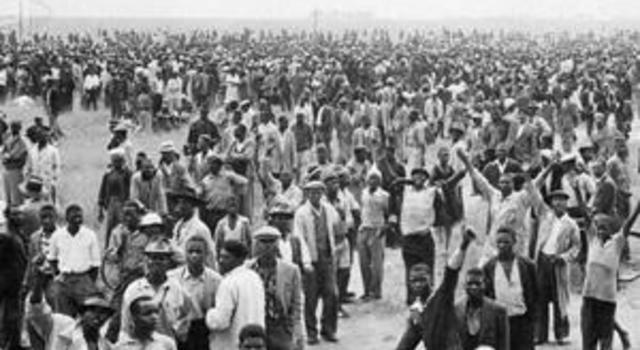 In 1960, people held a demonstration against apartheid at Sharpeville, near Johannesburg, and the police shot dead 69 black people. The government blamed the ANC and banned them from existing. As a result, Mandela had to hide and use disguises since he was being hunted by the police. Meanwhile, millions of people in other countries supported the anti-apartheid movement. Many nations stopped trade with South Africa, and sports teams and entertainers refused to go there. But the government still refused to change. 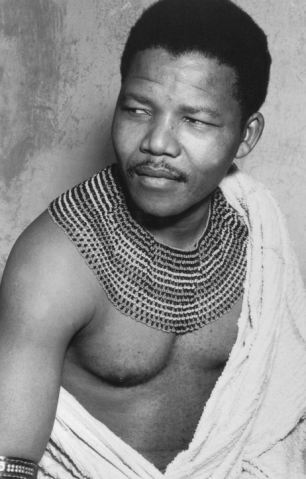 In 1962, Nelson Mandela was arrested again and accused of plotting to overthrow the government. In 1964, he was given a life sentence in prison.Mandela was sent to prison on Robben Island, along with other ANC leaders. He spent a total of 27 years in prison, and was allowed one visitor every 6 months. 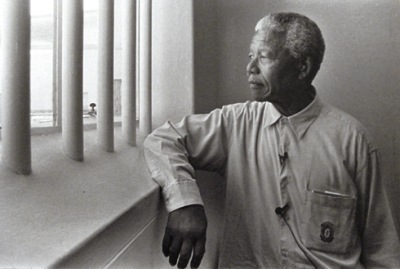 Mandela became the most famous prisoner in the world. He did not give up – even the prison guards admired him. 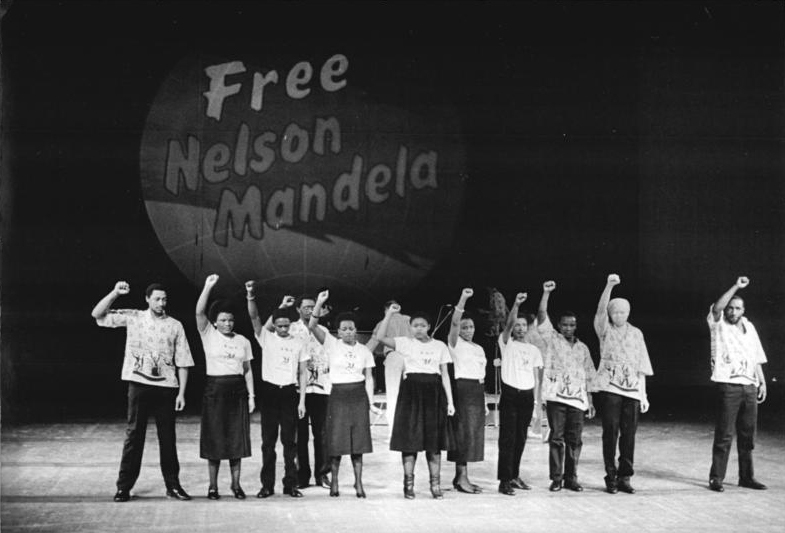 From around the world, the calls got louder: Free Nelson Mandela! 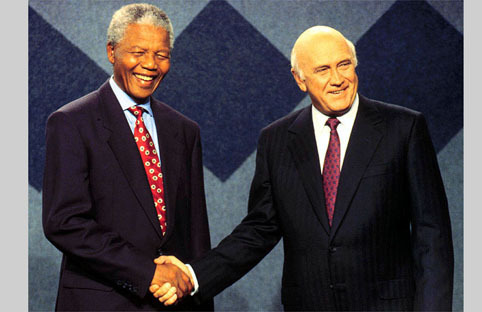 In 1990, South Africa’s new president FW de Klerk set Nelson Mandela free. 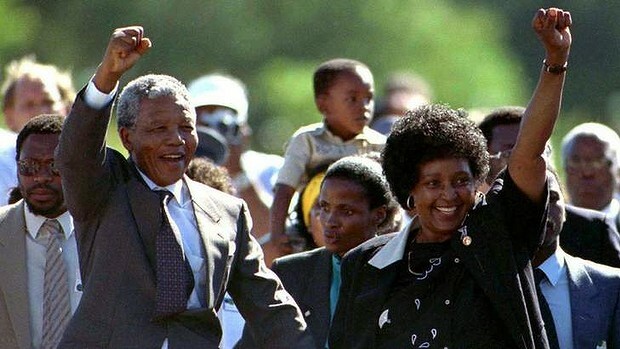 Mandela and de Klerk agreed: no more fighting. 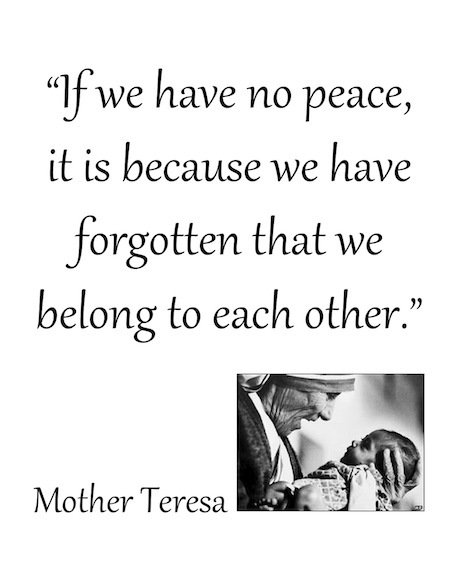 Mandela called on all South Africans to work together in peace. 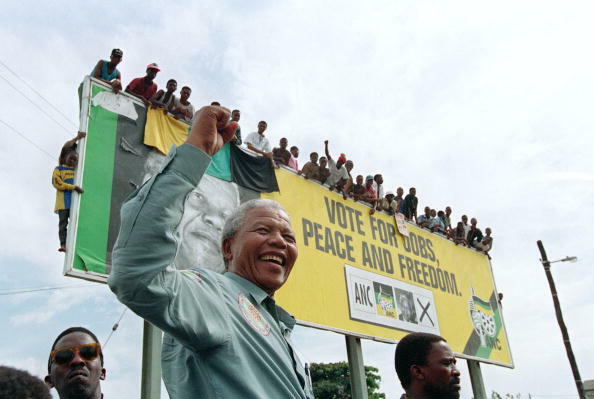 In 1991, Mandela became leader of the ANC. 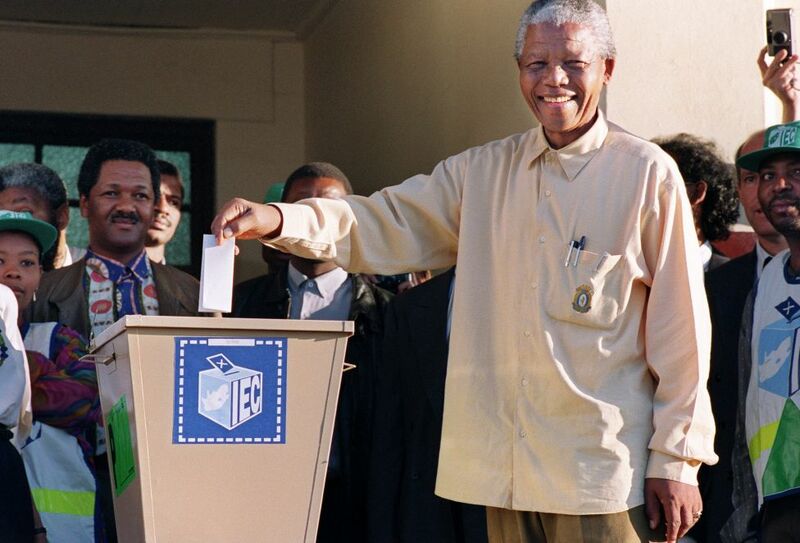 In the 1994 elections, all black people in South Africa were able to vote for the first time, and the ANC won the election. 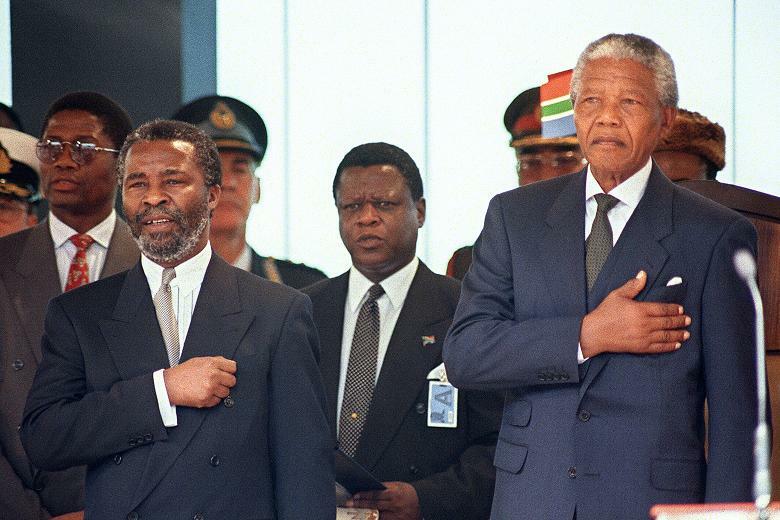 A new government took over and in May 1994, Nelson Mandela became South Africa’s first black president – he was 75 years old. Among many of the things he accomplished while in office, he is credited with helping the country of South Africa become a multiracial democracy. Gandhi has been called “the liberator of India in South Africa” and is also seen as a founding father of Mandela’s South Africa of equal rights for all people. Gandhi and Mandela came to a shared conviction that all suppressed people, whatever their differences of religion or ethnicity or caste, must stand together against their oppressors and, in Gandhi’s words, “cease to play the part of the ruled.” Only a changed mindset could change the structure of white, colonial power. Mandela many time referenced Gandhi as his biggest inspiration and he considered him his role model. 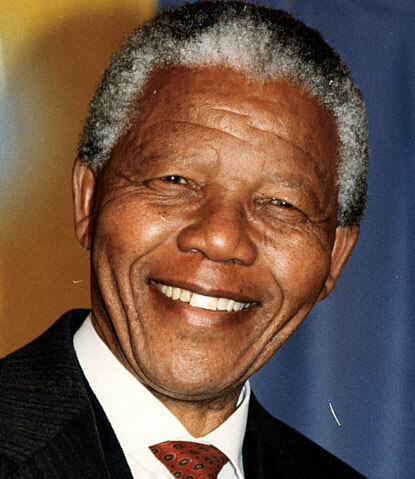 Nelson Mandela has been compared to the Father of the Nation of India by many historians and experts. There are striking similarities between both great leaders that brought them international repute and followers. The path of nonviolence trekked by them to free their country of slavery and dominance raised them to the same pedestal. Both Gandhi and Mandela are considered world leaders for their undying efforts towards the liberation of their country and bringing justice to the countless fellow countrymen. Neither of them sought violence for achieveing the freedom of their land. Their morals were high and clear-cut about fighting for the nation in a dignified and nonviolent manner. Mandela is referred to as a true Gandhian by the Indian democrats and diplomats. He is famous as one of the heirs of the Gandhian ideology of nonviolence and struggle for human rights. They both spent a lot of time in the same prison in Johannesburg, Fort Prison. Morever, Gandhi lived in South Africa from 1893 to 1914 and was also a victim of racial hatred while traveling in the country. Gandhi and Mandela were both lawyers and Mandela went on to establish the first black law firm in South Africa. Gandhi had always believed that there would be someone in South Africa to take up the cause of the blacks and work towards the freedom of the country from oppression. Social and political injustice would be shunned by the masses and the land would be free. On receiving the prestigious Nobel Peace Prize, Mandela spoke profoundly of Mahatma Gandhi and how his teachings helped South Africa overcome Apartheid. Both these leaders are respectively hailed as the Father of the Nation in their countries. They are loved and respected across the masses and ages. They are paid homage by the international community for sacrificing their lives for their country and taking the cause of humanity to different corners of the globe. Both Gandhi & Mandela demonstrated to the world they could build inclusive societies, in which all Indians and South Africans would have a stake and whose strength, they argued, was a guarantee against disunity. They both left legacies behind that we can learn from. For me, the most striking thing is how they both walked a long road to freedom, and all the while stayed committed to nonviolence. I hope my fellow ahimsakas will join me in continuing to learn from these two great leaders as we strive to make the world more peaceful.